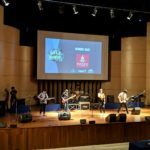 On Saturday 9 February, 17 students from Bromsgrove traveled to Brighton College Bangkok to compete in the 2019 TISAC Secondary Battle of the Bands. 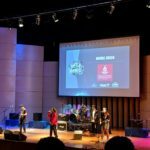 Our Year 8 band, School Daze, performed in the Lower Secondary category, with their set including the AC/DC hit, Back In Black. The band have been preparing for their first ever show in their Music lessons this half term, through the ‘In At The Deep End’ unit, which was first introduced at Bromsgrove by Musical Futures International when they visited in November 2017. Its fantastic to see a classroom group given such a great opportunity to share their learning and performing to such a high level after just a few weeks. 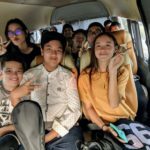 In Upper Secondary we entered two bands from our popular Rock School ECA. 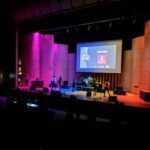 Black Eagle performed an energetic set which included the Guns N’ Roses classic, Sweet Child of Mine. They were followed later in the competition by Mondegreen, who performed Bad Romance by Lady and Nina Cried Power by Hozier. Come the results, we were delighted to hear that Black Eagle had been awarded 2nd place once again, having now been in the top 2 bands for 3 years in a row. 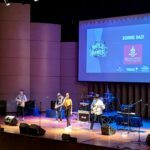 This is also the fourth year running that Bromsgrove have featured in the top 3 bands of the competition!